It’s hard to imagine an investment fund that can make life any easier than this. The fund offers a diversified, global asset allocation in a single product. 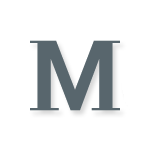 It automatically rebalances that asset allocation for you. It gradually dials down the equities and dials up the bonds as you age – lowering your risk exposure as retirement draws nearer. It does almost everything for you bar filling out the direct debit. 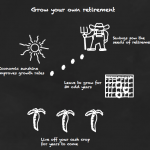 All you have to do is decide when you’re going to retire. Each Vanguard Target Retirement Fund comes with a target date that identifies the earliest year its investors are expected to retire. For example, Vanguard Target Retirement Fund 2020 is aimed at investors who plan to flick the Vs to working life between 2020 and 2024, while the Vanguard Target Retirement Fund 2025 is just the ticket if you’re planning to hold your F.U. party between 2025 and 2029. And on we go in five-year steps out to the impossibly futuristic Vanguard Target Retirement Fund 2055 – by which time The Investor will be tapping out posts with his cyber fingers and I’ll be an upload in The Cloud. If you’re a forward-thinking 15-year old who’s already dreaming of a life on a Martian golf course from 2060, then no doubt Vanguard will soon be releasing a fund for you, too. They invest in an underlying selection of Vanguard index funds. They are cheap. The Ongoing Charge Figure (OCF) is expected to be 0.24%. Taken together the Target Retirement Funds are like cars on an asset allocation rollercoaster that careers downhill from peak equity to the bond flats below. Vanguard’s example supposes the journey starts at age 25 and ends with retirement at age 68. Equity allocation is 80% for the first 18 years up until age 43. The other 20% is in bonds. 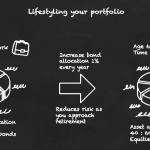 The portfolio gently derisks until you are 50:50 equities to bonds by age 68. There’s a steep decline over the next seven years until you’re 30% equities, 70% bonds. At that point, the asset allocation flatlines. It remains 30:70 in favour of bonds for as long as ye shall live (or your money lasts). Of course, the fund trundles on regardless of what age you are when you hop aboard. The Target Retirement Fund 2015 is split 50:50 (at the time of writing) so that would be your initial asset allocation if you piled into that fund right now, regardless of whether you happen to be 21 or 97. Over the next six years it will glide down to 30:70. This means that even if you’re a glamorous showbiz personality who has spent a lifetime fibbing about your age, you should be honest with yourself when you’re deciding which fund is right for you. Frankly, the approach offered by Vanguard’s new funds is all very reasonable and based on a standard investment technique known as lifestyling. The idea is you load up on equities when you’re young and time is on your side, to benefit from their historic knack of outperforming bonds over the longer term. Then you gradually store more of your wealth in bonds – which are less apt to lose half their value in the blink of an eye – reducing the chance of your gravy train being wrecked just as you were about to put your feet up. There is plenty of debate about whether this approach is right, wrong, defeatist, or optimal. The reality is that it will depend on your individual circumstances and unknowable future investment returns. But lifestyling is a perfectly sound theory and it makes a great deal of sense, particularly if you don’t have the time, knowledge or temperament to manage your own investments. It’s also reassuring that Vanguard is happy to lay down its methodology cards on the table. Vanguard manages the finer points of the asset allocation for you. Five years before retirement, UK index-linked gilts (cyan) come into play to help protect the portfolio from inflation. Again, it’s all perfectly sane. There is home bias in the allocation to UK equities, which makes increasing sense as you come to retire and want to dampen currency risk. The bond allocation includes global bonds and corporate bonds to diversify returns in this era of ZIRP (Zero Interest Rate Policy). But none of yer junk bonds or emerging market ones. The global bond funds are rightly hedged to reduce currency risk. Meanwhile the non-government bond allocation of the 2015 fund is approximately 15% – so not worryingly excessive. Emerging market equities are underweight, representing 8.5% of the equity allocation in the far-out funds and 5.6% of equity in the near-term 2015 fund. Personally, I’d prefer a heftier index-linked gilt allocation (it maxes out at 30% of the bond allocation), no corporate or global bonds and more emerging market equities in my mix. But if I couldn’t be bothered to going to the trouble of managing it myself then I could happily live with Vanguard’s broth. Temptingly, the index-linked gilts are short-dated (0-5 year maturities) which makes them less exposed to interest rate hikes knocking lumps off your capital value. Lower volatility options like that are ideal as you come to retire and there’s currently no short-dated index-linked alternative available as a separate tracker fund. The most obvious danger is that being young is no guarantee that you can hack an 80% equity allocation. Theoretically, you’ve got years to recover if things go south. But that’s cold comfort if you freak out and sell during a bear market because you’re in way beyond your risk tolerance. Of course, you could choose the Target Retirement Fund with the equity-bond mix that best suits your risk tolerance rather than your age. But take care to check its asset allocation serves your needs as you countdown to retirement. If you go for a 50:50 split you may not want to be 30% in equities when the fund powers down seven years later but your retirement is still over a decade away, for example. To get a feel for these issues, estimate your risk tolerance or try this respected test. The other big danger comes from relying so heavily on Vanguard’s auto-pilot that you forget to check if you’re still on course before the fund touches down. Ultimately your fund will need to hit your target number by its target date. …over a long enough period of time. If performance is falling short, human intervention is needed in order to up your contributions, extend your timeline, or reduce your needs. 1. A Target Retirement Fund may not be tax efficient if it isn’t entirely sheltered by your ISAs, SIPPs and personal savings allowance. That’s because bond interest payments are taxed at income tax rates rather than dividend income rates. 2. You can buy cheaper. The underlying components of the 2055 fund can be bought in the same proportions for 0.14% per year rather than 0.24% in management fees. That’s a 32% discount for self-management, assuming you don’t pay dealing fees on fund transactions. Naturally that has to be set against the hassle factor and the chimp factor – that is, the fair chance you’ll self-sabotage at some point because we’re all barely down from the trees in investing terms. 3.There’s no tilt to property, nor any of the factors that can further diversify a portfolio. I’ve got lots of friends and family in this camp. I would happily put every last one of them in a Target Retirement Fund. The alternative is likely to be much worse. P.S. Vanguard has occasionally made changes to the US version of the formula in response to market conditions. It previously increased the equities allocation and also broadened international exposure to equities and bonds. If you’re buying into the Target Retirement Funds for convenience – rather than because you have strong views – then you’ll probably be glad someone is keeping an eye on things, but beware. I have received a semi-sensible answer from iWeb at last. The Target funds are not currently available, but I was informed that iWeb use the Cofunds platform, something I did not know previously, so I assume the Target funds will be available when Cofunds add them. Just an update to my comment above – Interactive Investor replied to me to confirm that they ‘expect this [fund] to be available for trading no later than next week’ i.e. beginning of June 2016. The Target Dated funds aren’t yet available on Alliance Trust Savings. But they informed me they are in the queue to be added. No specific date but it will probably be in the next few months. I really like the idea of the Target Retirement Funds and have even recommended them to others. The problem as mentioned in the comments is, if you invest with Hargreaves like I do, then the platform fees are quite prohibitive. So I’ve ended with mainly ETFs because, acting as shares not funds, they circumvent the hefty fees – for now at least. I like the Hargreaves in many ways, such as the website and customer service, so it’s trade offs as nearly always. I am thinking of selling all my 7 SIPP ETFs and ITs and just buying VT – which is very cheap, $US denominated, diversified with some small companies and emerging markets, a lowish 5% return a year but 3.31% div – and holding for 15 years. 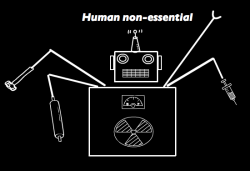 I don’t do bonds, just have NS&I index-linked bonds for reduced risk. I would love to hear all your views on that? Hi D, what does VT stand for in this case? Also, why not invest with another broker if you’re convinced by Target Date fund? Otherwise it’s tail wagging dog. VT is Vanguard Intl Equity Index Fund Inc Total World Stock ETF (VT). It has around 7,000 stocks so I will just forget about it. So far I have my ETF/IT holdings as per below for around 6 years so not a fiddler. Average TER is around .60%. CYN is an outlier at 1.20% (and just 5% of portfolio). Correction: I recommended the Lifestrategy funds not Target funds to others. I have ISAs with Hargreaves as well. When I move jobs I like to move all my pensions into one place and Hargreaves, through their stability and keeping funds in separate trusts, offer strong security. Price is important but not all. Aha. VT is a NYSE listed fund so HL would charge for currency conversion. The LSE listed equivalent is VWRL – Vanguard FTSE All-World ETF. If you’re after income then you could look at VHYL – Vanguard FTSE All World High Dividend Yield. Basically it’s the ETF answer to LifeStrategy particularly as you don’t want bonds. Why international small caps rather than broad international tracker? Or conversely, why no UK / emerging market small caps? 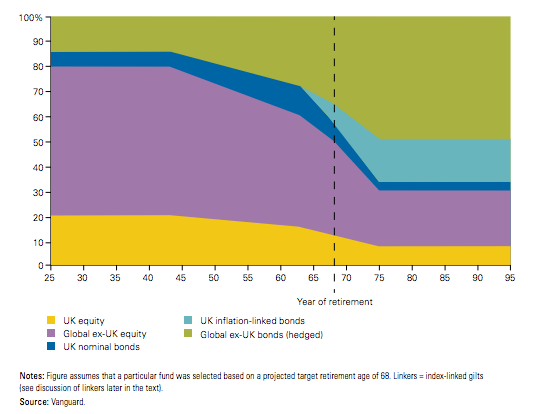 So…… Interactive Investor now have all the Vanguard Target retirement funds available EXCEPT the 2030 one (why ?!) which, of course, is the one I’m interested in…. VWRL is indeed listed in the UK, but it is overwhelmingly large equities with around 2,000 stocks. VT is more global with midcaps, smallcaps and emerging markets. I prefer the allocation as the global economy shifts Eastwards with growth over income for the long term. What to make of tax advantages of VT vs VWRL if resident in the UK? I will carry on using W-8BEN to claim back 30% of tax on divs. Does it really matter in the scheme of things? Again, you also need to factor in the foreign exchange charges that Hargreaves Lansdown levy on trading US securities. I looked into this a few years ago and found the fx charges made it a wash for me personally. That’s not to say you will come to the same conclusion and I wasn’t looking at HL. Also, you may become liable for US estate taxes on US securities even if not a US citizen. Finally, over time I’d expect a fund with more small caps / mid caps to outperform a large cap fund over time but it’s not a slam dunk and comes with an increase in risk. I am still not clear if it is wise or not to choose VT. For example, being liable or not for US estate taxes is not conclusive. It seems prudent not to entertain that surprise. I already have GWX (as above) and I am wondering about that now. Just a thought, target retirement funds (vanguard) eventually shift your portfolio to bond heavy allocation on your retirement, thus income (yay!). Say, I have invested into accumulation units during the early years, does this mean it will automatically convert to income units for it to be income generating fund? Or will it just continue to balloon into bigger pot? PS. I am looking at regular income from this fund in my later years, not lump sum from liquidating the whole pot. hi Botoman, it will balloon and you just sell the number of units you need to create income. You might do this at the start of the year for example, selling enough units to provide a year’s worth of cash. I have been looking into target date funds as one way of simplifying saving for retirement – but also out of interest to see what their asset allocation by age is. After all, a lot of people seem to say that the equities/fixed income distinction is the most important thing. Looking at Vanguard, I think they may assume that people in retirement will be going into drawdown, rather than buying an annuity. And I wonder whether, for would-be annuity buyers, the downards curve should be a bit sharper and perhaps earlier. And perhaps it needs to be clear, too, that if people are upping their equities exposure, for longer, because of rising life expectancy, they need to expect to retire later. The fact that we are living longer does not in itself make markets less volatile! So there it is. I’m at 60/40. But I wonder if I am being too cautious when I see all these target date allocations. The truth is that precision is a myth in this field, you can only be in the right ballpark and ‘right’ depends on your circumstances. Rules of thumb offer some rough guidance and at least tell you enough to probably steer away from your Austrian acquaintance. You’re obviously giving the topic a lot of thought and that’s ultimately what will guide you to a place that’s comfortable for you. Thanks! All useful links. If the final outcome having balanced out (estimated) risk tolerance, age etc. can be a “muddy compromise”, I’m there. I like the idea of the Target Retirement Funds,but I also like to know exactly what my asset allocation is in a given year.How will I be able to calculate the percentage split each year when the fund merely mentions a ‘glide slope’ ? Will Vanguard publish this information for each fund? Thanks to this site I started investing is Vanguard LS 80 a little over 2 yrs ago and it has increased in value by around 22%! I’ve recently put a little in LS100 as well just for fun. I always planned to move more towards 60:40 over time,but with the retirement target funds is it less hassle to just move everything into one of those? Hi Spooner, yes, a target date fund is even more automated than LifeStrategy as you don’t even need to lifestyle it. Not sure why you’d invest in a world fund. LifeStrategy is already globally diversified. Thanks TA, I may look into moving it at an appropriate time. For the world fund I felt that I wanted to put some funds into more emerging markets ……But as you can tell I am very new to this and just finding my feet by reading most of your website bit by bit! I’m considering opening a SIPP with Cavendish with a single fund. I only have a small pot currently of 10k and picked Cavendish for the low platform fee. I’m 32 and on the bench with choosing 2050 target retirement fund or use LS80 and lower the equatity every decade. I plan to put in around £300 a month. My daughter is 32 and she has the Vanguard Lifestrategy 80% Equity 20% Bond fund. From memory I think she also uses Cavendish. As this is is a fixed asset allocation,you might consider swapping it to a 60/40 allocation when you get into your 40’s I have always used the old rule of thumb for my allocation i.e. ‘Own your age in bonds’ and the balance in equities. Its worked for me. Good luck. Quick question: presumably if one chooses the managed fund (lifestrategy/target retirement) route, you could still choose to invest further in individual index funds of your own choosing? (Assuming you didn’t exceed the £20k ISA limit in the current year? You could,but why risk duplicating what you might already own in the LifeStrategy/Target Retirement Funds? Keep it simple has always been my motto. Depends on whether they charge you every time they sell a fund to pay your fees. If they do that then I’d rather have the cash in there. I just use some of my dividend payouts to cover it. Mmm this is great, I appreciate TA breakdown of the target funds, not given it attention before. I agree its abit low in Emerg’Markets though but i could keep a seperate EM tracker to run along side it as bit of a wild card! seriously thinking about selling my ETFs and putting all in a target retirement fund. im with I web [ isa ], they have it, just checked, and they dont charge for holding funds. got me thinking. As TA states it stops you meddling !!! Just had a quick peak at the Vanguard site and saw these retirement funds all the way to 2065… I was a bit late starting my pension and didn’t want to have this happen to my son, so I opened a SIPP for him when he was 9mths old and since then a JISA too. He is 9 now and has 20k in his SIPP split 16k on a V LS80 and 4k on a V LS100, his JISA has 6k of a BlackRock Natural Resources Gr & Inc D Acc as I just fancied a play on a resources super cycle at some point in his lifetime (I missed the last one) and when I set it up, this fund was really cheap as resource companies had the crap kicked out of them by the 2008-2010 downturn…its all with AJ Bell Youinvest. Wow. Well done Paul on your incredible far-sightedness. I don’t think any other readers have mentioned setting up a SIPP at such a tender age for their children. Global REITS are the obvious diversifier as Vanguard don’t run a commercial property fund. Other possibilities are Global Small-Cap and other factor funds e.g. Value. Especially as your son has a super-long time horizon so can afford to wait out volatility and hopefully enjoy stronger returns in the long run. You could make an argument for 5% in gold as a good diversifier – although I’d argue against it as compounding will become a huge factor for your son later in life and gold doesn’t pay dividends. thanks, you make a good point, I was just thinking of 80-100% global equities because there is so much time to recover from any big drops….but actually you make a fair point that there should be no harm in trying to turbo charge returns now (Value) and in diversifying a bit, again now… I have my own iShares Global Property Securities Equity Index (UK) D Acc, which used to be blackrock global property, I’m minded to add some of thee in his plans and seek some value options. Cheers!